The intertidal zone is the area of coast where the land is exposed between low tide and high tide. 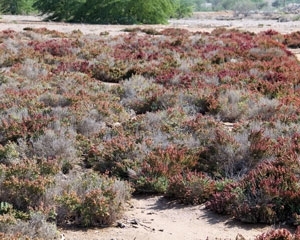 In the Gulf of Oman the tidal range (the difference in height between low and high tide) is only up to 2.5 m. The generally soft wave action here allows for specially adapted plant species to take root in this harsh hot and salty environment. Plants growing here such as saltbush are halophytes: plants that can either tolerate or need salt in their water supply. Animals such as crabs that live in the intertidal zone not only have to look out for sea predators when the tide is in, but also for land predators such as foxes when the tide is out, as well as predators from above such as hungry gulls.